This election isn't the only big story happening right now in the region. This weekend, the $240 million Hoover Dam Bypass Bridge -- to be known as the Mike O'Callaghan-Pat Tillman Memorial Bridge -- opens. It's a fairly impressive feat of modern technology, this being the longest bridge arch in the Western Hemisphere and the second tallest in the U.S. 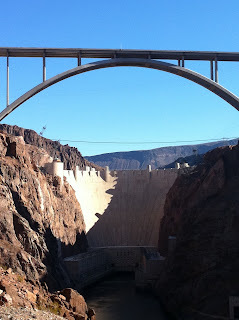 The point is to take most of the car traffic off the two-lane Dam and to prevent truckers from having to drive down to Laughlin and up to go from Arizona to Vegas. Since 9/11, they've had to do so as an anti-terrorism move. I'll be writing some stories on all this in the days to come and will link to them when I do. But for now, I spent this morning out there doing interviews and such. The shot above and some below were taken at a privileged vantage point, a helipad landing off a dirt road not accessible to the general public. We were brought there so we could get the best, unobstructed view of both the bridge and the Dam. They were setting up for Thursday morning's muck-a-muck ceremony. Sen. Harry Reid, Rep. Dina Titus, Arizona Gov. Jan Brewer and U.S. Transportation Secretary Ray LaHood will be on hand and speechify from down on this landing. Nevada Gov. Jim Gibbons will send Lt. Gov. Brian Krolicki because Gibbons is recovering from a major horse mishap that led to an X-ray of his steel-fortified pelvis to morbidly be splashed on the pages of today's Review-Journal. The O'Callaghan and Tillman families, the workers on the bridge, some media and some members of surrounding Indian tribes will be on the bridge itself. The speeches will be broadcast up there somehow. I'm torn at the moment about whether to go. There's no question the bridge is impressive, dignified and stately. 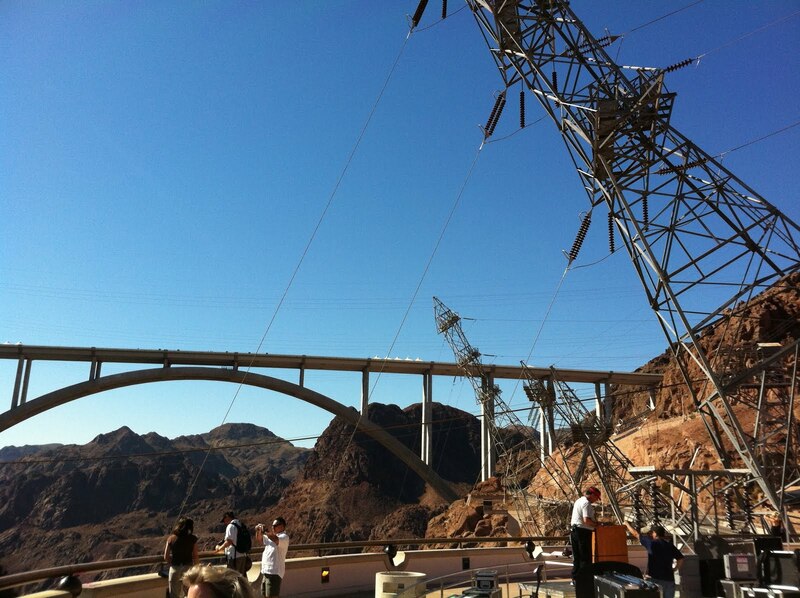 That said, I admit that it actually looked cooler while it was being built. Above to your right is a strip of photos that ended up on my phone somehow (no, really, I can't figure out where this came from) that shows the progression. 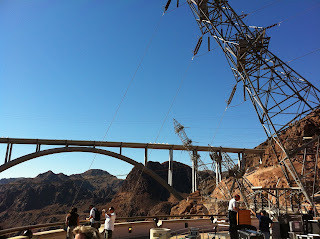 I've been a sucket for Hoover Dam tours for 30 years, I never tire of taking the elevator down and seeing the generators. The experience changed after 9/11, but what a great place. 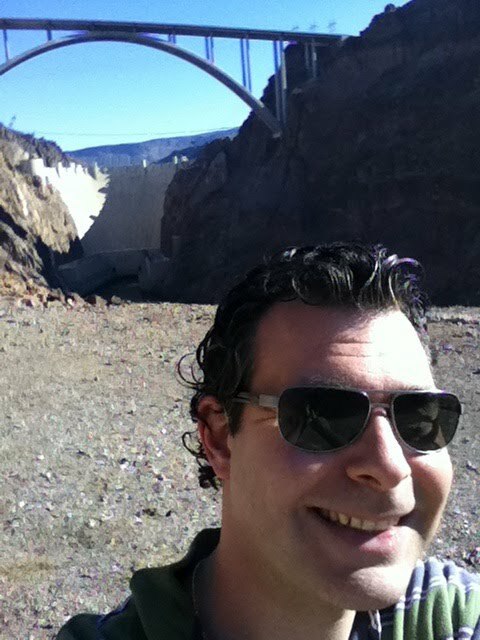 It won't be the same not being able to take the twisting road, actually driving over the dam itself.